Father of the Bride. Touchstone Pictures 1991. Here’s another for the “never wanted it enough to go get it” list. I’ve been somewhat interested in this film on the grounds that it’s a Steve Martin movie and it was fairly popular for a long time. It looks enjoyable enough, just not necessarily a big enough movie to care as much as I seem to recall people did. Maybe I’ll get another L.A. Story experience out of it. Also, I’m surprised to learn that Martin Short is in it. From what I know of his role, he’s probably only headlining because of his big name, but he’ll be fun to watch. George Banks loves that nothing in his life changes. He’s lived in the same house for almost twenty years, and his relationship with his family is just as steady. Then his daughter Annie (who claims to be 22 but looks 16) returns from studying abroad and immediately announces that she’s engaged. George overreacts to everything, but eventually starts to come around and deal with six months of craziness to put together a wedding for hundreds of guests at ridiculous expense. This isn’t easily compared to other films, besides the one nobody talks about that this was a remake of. At first it felt like Guess Who’s Coming To Dinner without the racial issues (appropriate, since Spencer Tracy was the father in that and in the original Father of the Bride), but it eventually stopped being about George’s refusal to accept that his daughter is getting married and became about George wincing through a wedding spiraling out of control. Steve Martin plays one of the most normal people I’ve seen him do. At times his behavior is cartoonish, but it’s still completely understandable. 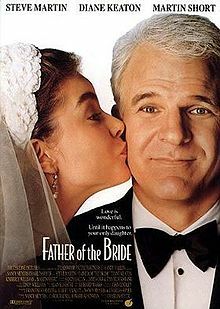 The entire film seems understated and down to earth, even though it gets away with jokes like “Annie doesn’t listen to George but immediately agrees with her fiance’s agreement with George” and an extended sequence of George getting into trouble snooping around the groom’s parents’ house. I think this is largely due to the music. Or rather, the lack thereof. Alan Silvestri composed the score, and for what there is it’s fantastic. But very few scenes have any music at all. The acting is left to speak for itself, and so it seems much more natural. George staring at Annie’s knee being groped with fire in his eyes is just that, without any enhancement from mischievous clarinet or ominous strings. When the music is strong enough to be noticeable, it’s recognizable. Besides the popular songs, the score frequently returns to arrangements of Pachelbel’s canon and the Wedding March. Still, it’s been adapted skillfully to the situation. Silvestri may not have written much, but he wrote well. Ultimately, this is just a sweet story about a father letting go, and the hassles that distract him from that and at the same time force him toward it. It’s soft-spoken and simple, yet often hilarious. Exaggerating the comedy would have diminished the poignancy. This film is exactly what the story needs it to be. Watch this movie: with a date. This is one where I think it would be well worth your while to also watch the Spencer Tracy version. And maybe read the book it’s based on. It’s a fascinating study in good adaptation. From book to film, then from 1950’s film to 1990’s film.